Could One Angry Wag Of Chris Christie's Finger Derail His Fait Accompli Re-election? 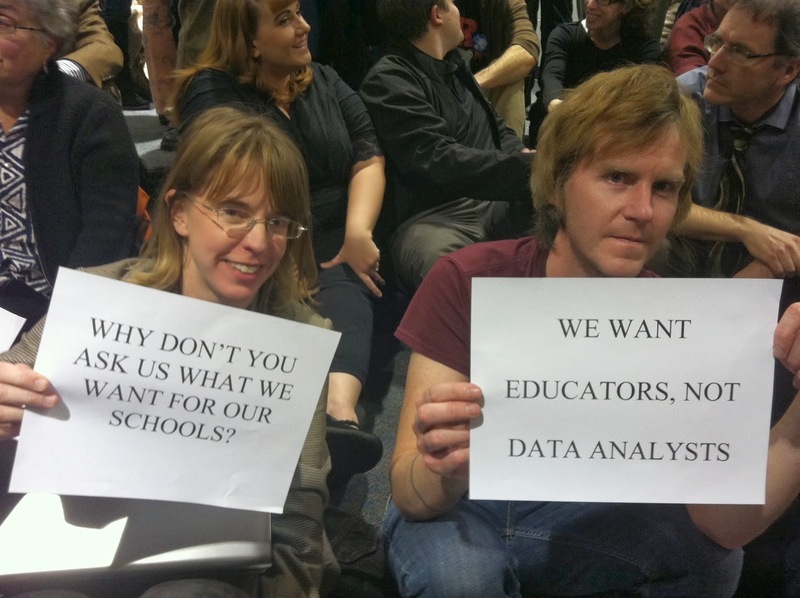 Over the course of the last 24 plus hours many of us who follow education issues have read a great deal about Governor Christie's angry finger-wag in the face of yet another teacher. The story has already gone national, and the timing could not be more perfect. 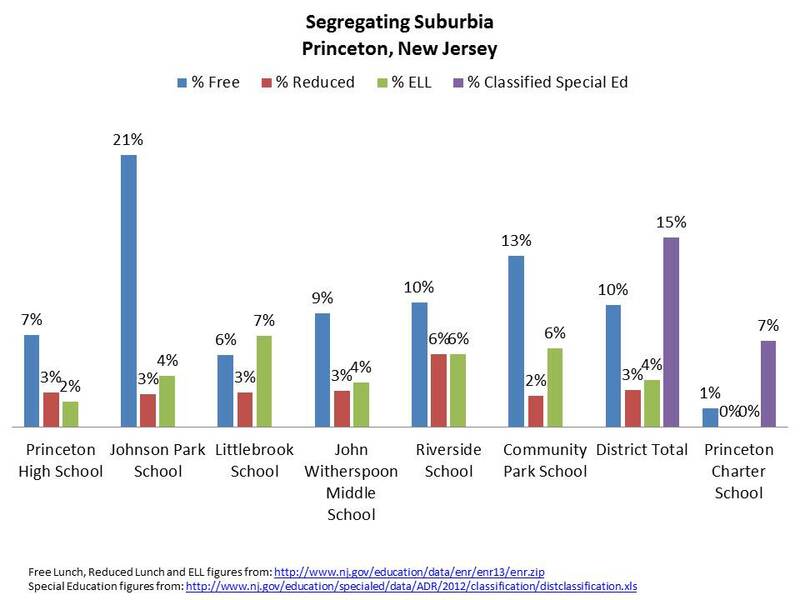 why he calls NJ schools "failure factories." 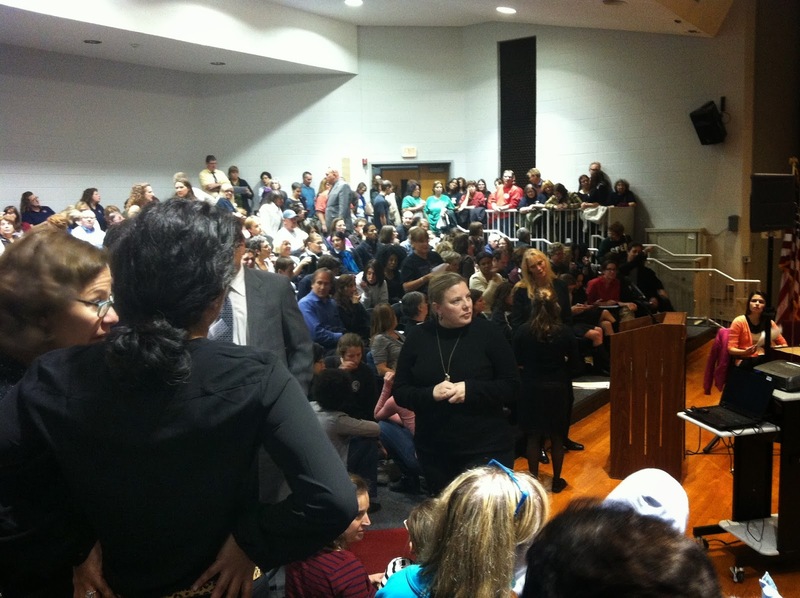 Why was Christie laying low? Because the man can read a poll, and polls say his education policies are wildly unpopular. Here's an entirely unscientific poll, but a good one none the less. 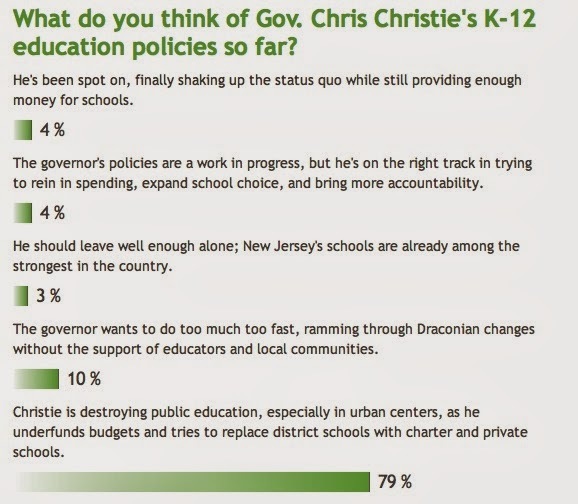 NJ Spotlight readers were asked what they think of Christie's K-12 education policies. Only 4% said he is "spot on" while 10% say he wants to do "too much too fast" and a staggering 79% say he is "destroying public education." Let's look at something a tad more scientific. 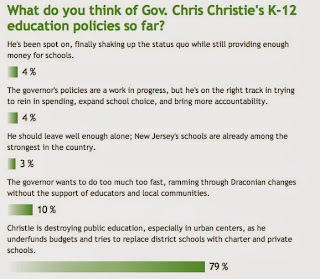 A Rutgers-Eagleton poll was released last month, and there is no doubt, education issues are Buono's strength and Christie's Achilles' heel. There has been a searing dislike of both Christie's arrogance and his education policy for years. This is from a 2011 Rutgers-Eagleton poll. 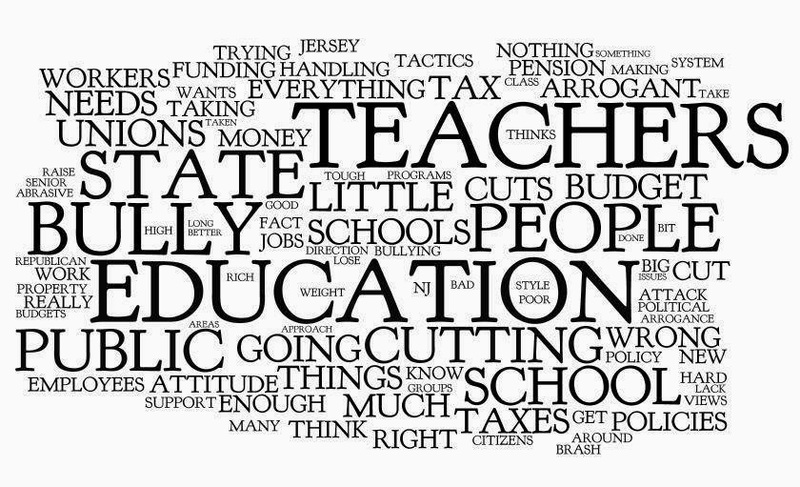 The word cloud of reasons people don't like Christie is a graphic reminder of why yesterday's incident resonates for so many New Jersey residents. 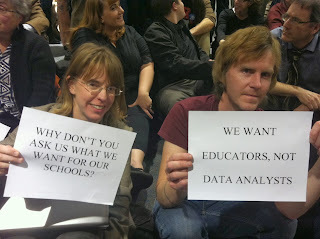 Hard to say which is more prominent; "teachers", "education" and "bully" are all right up there, aren't they? 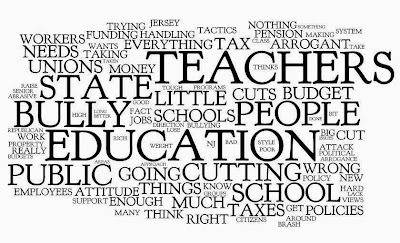 This word cloud confirms EVERYTHING New Jersey doesn't like about Christie, and he put it ALL out on display yesterday. And he waggled it in the face of an elementary school teacher. Stay classy Chris, stay classy. Yet Barbara Buono, a civil, dedicated candidate with policy positions more in keeping with the people of New Jersey, has been unable to get traction because far too many people in this state are blinded to Christie's celebrity. “For the last several months we have reported that voters disapprove of Christie’s performance in key areas,” said Redlawsk. “The problem for Buono is that she has not convinced them she would do any better." The question is, has she not convinced them, or has her message just not reached them because she has been eclipsed by Christie's enormous celebrity? 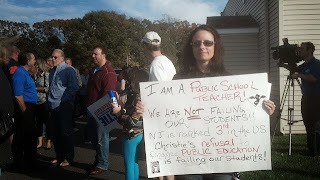 I can't help but hope that perhaps Christie's latest gaffe is such a blatant affront to the hardworking, honest teachers and other employees of this great state, that Christie himself may have finally helped untold numbers of voters finally see Barbara Buono as the more viable candidate. 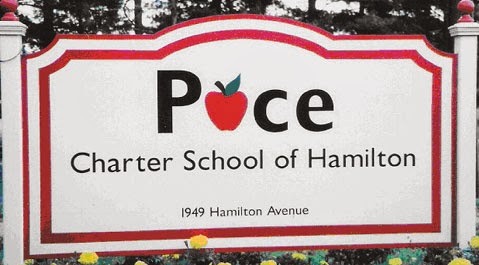 The sheer arrogance of this man's disregard for a teacher who was advocating for her elementary school students may just "draw the clicks" Buono's campaign has been lacking. Jersey Jazzman reports that his post about the incident received 30K hits in 12 hours. That's not too shabby. Bob Braun laid out exactly why he will vote for Barbara Buono. I am voting for Barbara Buono because she respects those who believe in the life of the mind. Every governor in the past—Republican and Democrat—has supported the efforts of public school teachers to educate our children. But, now, teachers have been bullied, verbally abused, mocked and ridiculed by a man who is a poster boy for how not to behave. 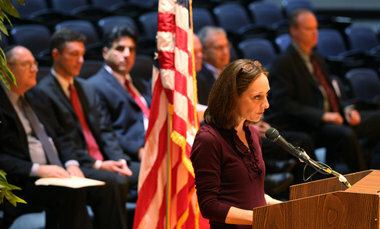 Buono sponsored New Jersey’s anti-bullying law—and, now, for all of us, she is the anti-bully. Cause I gotta tell you–you know what, punk? I’m tired of you, too. If you too are tired of Governor Christie, let's make this happen. 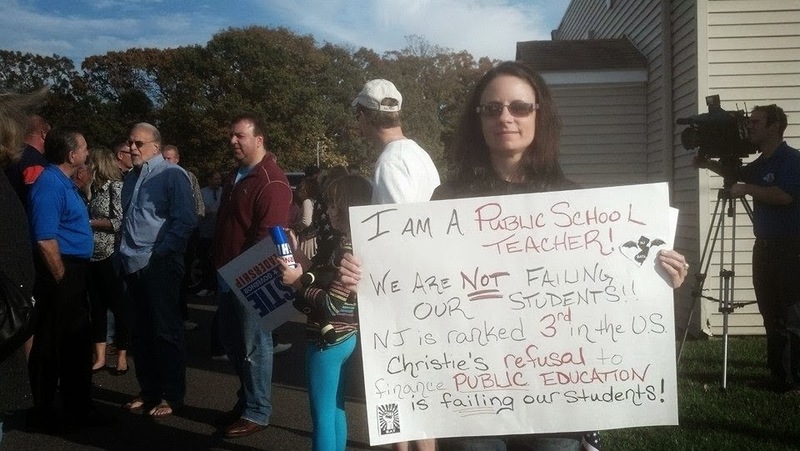 Chris Christie DOES NOT represent the people of New Jersey. Polls show voters disagree with him on almost every major policy issue. The problem is, every time we turn around the cult of Christie's personality is on our TV, or on our radio, or on our computer screen. He re-election just starts to feel like a fait accompli. 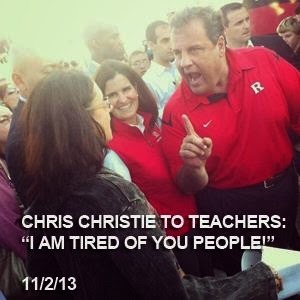 Do not allow Chris Christie to be re-elected because of his larger than life persona. He does not represent us now and he never has. No one can sit out this election. Share this story with like-minded friends, family and neighbors and GET OUT THE VOTE!